Stars of this year's Robin Hood Tax campaign film 'Future News', launched in February. 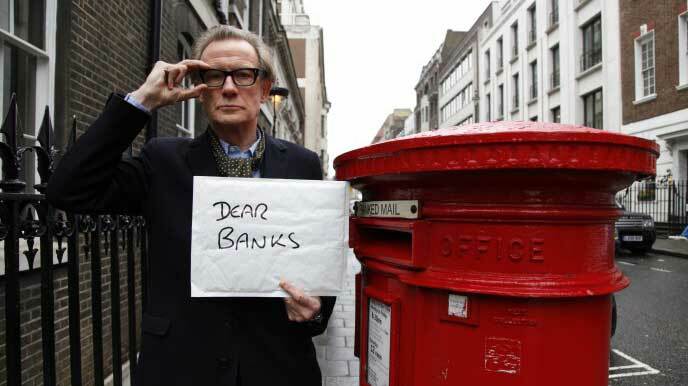 Our year started with a bang: we launched Future News, our latest Bill Nighy film. Short, funny and informative – it has now been watched more than half a million times! At the end of the film, we asked you to back the Million Strong campaign – to get a million actions backing a strong Robin Hood Tax in Europe that helps the world’s poorest people and the planet. You answered in your hundreds of thousands, with the petition now at more than 940,000! Just one final push and and we'll reach the million - you can add your name here. This year, the global movement for a Robin Hood Tax has been steadily growing. In the US, in September, over a thousand Robins turned out for a climate march in front of the UN building in New York. In Australia, nurses calling for a Robin Hood Tax toured the country in November, ending up at the G20 in Brisbane. We held stunts outside the Italian finance ministry and theEuropean Commission. These efforts culminated in a European Day of Action in December when massive projections were cast on government buildings in European capital cities demanding leadership on the Robin Hood Tax. And the public pressure is working: this month, Europe’s leaders threw their weight behind the introduction of a Robin Hood Tax during 2015 with revenues to start flowing by the end of the year. But banks are fighting back. They’re hoping to worm out of paying to clean up the mess they’ve made of the economy; all this despite yet another scandal-ridden year, with billions in fines paid out for foreign exchange market rigging and other misdemeanours. They’ve found support in the guise of Chancellor George Osborne, who has spent nearly £200,000 of public money batting for bankers in Europe, including a failed legal challenge to block the European Robin Hood Tax. In response, we’ve taken the battle to the banks, hijacking coverage of Barclays’ AGM in London in June and highlighting their wrongdoings throughout the year. Today (as I'm writing this) we have helped break a story in the Independent that since 2008, banks and building societies have received 19.7 million complaints - that is a rate of one every ten seconds around the clock for 6 years. Even more astounding is the level of fines: an astronomical £166bn since the start of the financial crisis. I'm sure you'd agree that if they can fork out so much in penalties without making a fuss about it, they can certainly afford to pay a modest Robin Hood Tax without having to whine about it! And the money is certainly needed. The age of austerity continues unabated with almost a million people visiting foodbanks in 2014. People are taking action in to their own hands with thousands calling on their local councillors to back a UK Robin Hood Tax. So far, 64 councils (representing a quarter of the UK population) have backed the campaign. They understand that an undertaxed financial sector can - and should - plug the holes in the economy. And with £20bn up for grabs, we’re looking to redouble our efforts in the run-up to May's general election to make our political leaders understand that there are alternatives to relentless cuts and the Robin Hood Tax is a leading candidate. It remains for us to say, thank you for all of your support throughout 2014 - we'll be in touch again, early next year. The Robin Hood Tax Team in Sherwood. Previous : Australia's nurses send a message to the G20 – a Robin Hood Tax for healthcare now!